Sunday, October 3rd was just one of those days, though clearly it was fall with the leaves on the trees showing their autumn colours it was still warm and the wind was calm. It was the perfect kind of day to take the kids and go down to the park for a picnic supper. 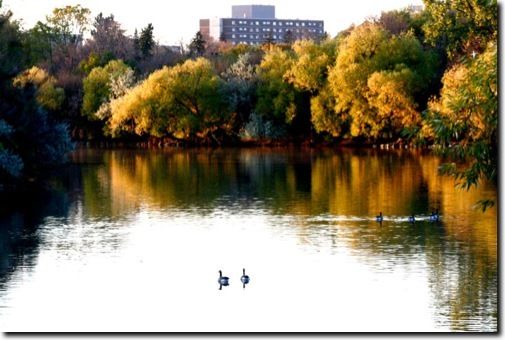 Wascana is a lush treed park in the very middle of the very flat city of Regina. The provincial legislature is on the south shore of the man made lake which is the home of hundreds of very contented Canada geese. This remarkable colony are the off spring of a small flock that in the early 1960s decided it was to much bother to migrate all the way down to Texas for the winter and they just huddled around the open water from the then operating power generating station situated on the northeast end of the lake. These non-migratory geese were most successful and within only a few years there were far more than the city of Regina wanted to support. Fred Baird, a naturalist at the provincial museum took it upon himself to get some volunteers together and they fed the flock then in the mid sixties they began annual round ups and a portion of the flock was relocated to various parts of Saskatchewan. Prior to this project Canada geese only passed over Saskatchewan’s prairie land spring and fall but did not make their homes on the flat lands. These new colonies took to the open country but since they did not have a power plant to keep them warm during the winter they adapted to making the long flight south each fall and back in the spring to their new habitat. Now there are Canada geese nesting on sloughs and wet lands throughout all of southern Saskatchewan.